When my husband and I got married in July 2016, we knew we wanted to get pregnant right away. God blessed us on Sept. 14, when news of my expectancy arrived. We excitedly began planning for the newest arrival to our family, and dreamed of what our future would look like. On Dec. 21, 2016, we went in for my anatomy ultrasound near the 16-week-mark of my pregnancy. My physician had told me he would see me at my next appointment, unless something abnormal showed up on the ultrasound. I kept sensing an uneasy feeling during the week leading up to the ultrasound, as if something was wrong, but I was assured that these were just “first-time mom” feelings. During the ultrasound, we saw the baby’s moving limbs, and the heart was beating strong. Everything looked great, and we left even more excited than we were going in. My uneasy feelings began to fade. I was at work the next morning when I saw my physician’s name come across my phone screen, and my heart sank. He explained that the ultrasound showed an abnormality, and he predicted a spina bifida diagnosis. I had no idea what that meant, and the rest of the words coming out of his mouth became a blur. He recommended we go to a lab to get blood work done and schedule a different ultrasound with a specialist..
Next, we received an amniocentesis from this specialist, and she referred us to a hospital in Houston. We researched hospitals known for their spina bifida programs across the country, and finally decided to switch our case to Texas Children’s Hospital. Soon after, which felt a lot longer at the time, we received a call from our wonderful nurse coordinator, Carol from Texas Children’s Fetal Center, who mapped out the options available to us and brought us toward making the next steps needed in qualifying for a fetal surgery that could reduce chances of hydrocephalus and preserve the motor functions our baby currently had. This entire conversation was so informative, but it was a lot of information to process at once. I was in complete shock, especially after learning that an in-utero procedure would be performed on our growing baby, and that we’d have to move to Houston following the surgery and stay until after the delivery. Carol explained that we’d need to come in for two days of testing if we were interested in moving forward with these options. We made the trip to Houston on Jan. 9 to meet the amazing team of doctors at Texas Children’s and endured a full day of testing. Before this first day, my husband and I decided we would do whatever we could do to make our child’s life the best life possible. When we met with the doctors on the first day, we learned that our baby had a L3-S2 lesion, which could limit its movement from the knees, and possibly the waist, down. Our baby could even suffer from hydrocephalus and kidney and bowel issues. Even though we had done plenty of research on spina bifida and its impact, hearing those words directed at our baby was incredibly gut-wrenching, and weren’t prepared to face the reality of the situation. We also learned how incredibly risky this procedure could be for our baby and myself, especially considering the potential impact it might’ve had on my ability to carry more children. We weren’t quite sure about which direction we wanted to go. We took all the information, every statistic and every option home with us that night and explored every possibility imaginable. That night, before we went to bed, we prayed for direction and guidance. We came up with three questions we wanted answers for. During the next visit, we had a few more tests to go through, and a handful of additional meetings with doctors. As we took in even more information, we were ultimately given answers for our three questions. When we walked out of our last meeting, my husband and I looked at each other and immediately understood which direction we would move in. We decided to go through with the surgery to give our baby the best possible chance at a great life. Our surgery was scheduled for Feb. 13, and we had a lot of things to arrange before then. We started searching for an apartment in Houston, I prepared to leave my job and home, and we began setting up a schedule of people who would come stay with me while my husband continued to work. On Feb.13, 25 weeks and 3 days into my pregnancy, we left to embark on this journey with our baby. The surgery was great, but the first few recovery days in the hospital were rough. It got easier each day, though. We were released from the hospital a week following the surgery, and moved to our apartment for bed rest in order to keep the little peanut inside of me for as long as possible. The recovery process became easier and easier each day, and our appointments went well visit after visit. It seemed like the surgery was doing its job! Each week of pregnancy that went became a milestone for us. When I was approaching the 39-week-mark of my pregnancy, my water broke and we delivered our healthy, 7 lb. 15 oz. baby girl the next day. We were able to keep the gender of our baby a secret throughout my high-risk pregnancy, even with weekly tests and ultrasounds, which was very special to us. We spent eight days in the NICU for monitoring, and were then released on our actual due date to return home with our miracle baby. What an amazing day this was! We still travel back to Texas Children’s for appointments, but primarily we just love to visit our new “family” that has done so much for us through my pregnancy and beyond. “Thank you” will never be enough. 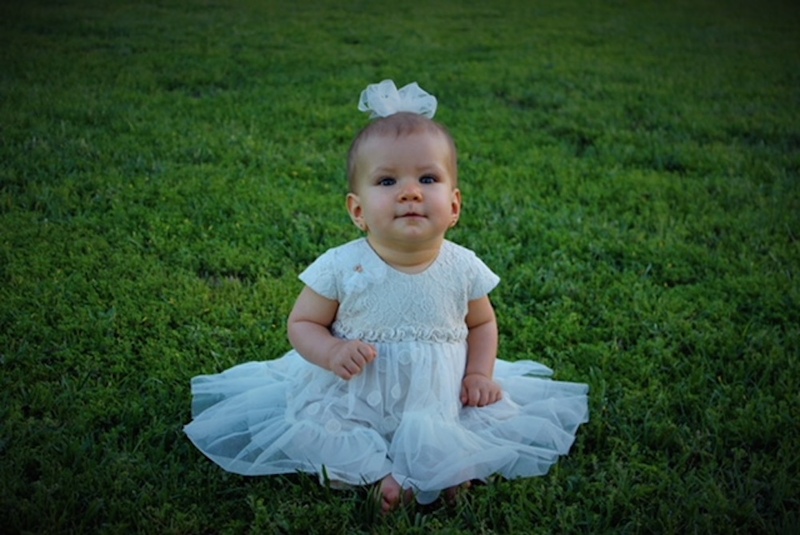 Our daughter, Olivia, is now 10 months old, and she’s developing normally. We haven’t had any issues with hydrocephalus; Olivia has normal bladder and kidney function and only slight bowel issues that have been easily treated. Olivia seems to be very strong in her legs, and she’s able to stand and bounce up and down when held up. She is crawling, sitting up on her own and pulling up on things. We know we have a long road ahead of us, but so far things have been going very well. We thank God every day for guiding us down the path that led us to Texas Children’s Pavilion for Women and their amazing maternal-fetal team. We know we made the right decision, and we would make the same one again in a heartbeat. We recently worked with Texas Children's to produce a video documenting our family's journey. If you're interested in watching it, click here.